You know that place in your home that you would really only let your very best friend come into? And even then, it would be only after you had known her for 15 years and you were bedridden and had no choice but to send her in for that necessary item? Well, let’s all just pretend that I am sick in my bed and all of you are my lifetime BFFs. Deal? You have to agree, because I am about to let you into…(gulp)…my closet! OK, before I let you in, let me tell you that honestly it isn’t that bad. There is a whole lot going on in there that is right, but on the whole it is pretty uninspiring. And honestly, part of my issue is that I am an employee of simplify 101, so I know I can do better than what’s currently going on in there. I am lucky enough that my husband and I have matching closets. You should see how nicely he has his organized. 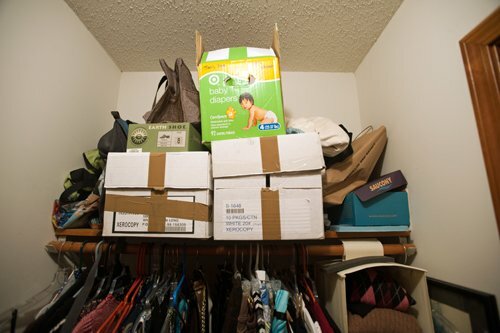 In fact, if anyone comes to our house for the first time and is taking the “grand tour,” I only show them his closet! Not terrible, like I said, but it seriously could be oh-so-much better. The door hooks are overloaded. Scarves swing out into the door jam when I close it. My hats are eating up space on my shoe rack. The little cabinets in there don’t work at all the way I need them to. 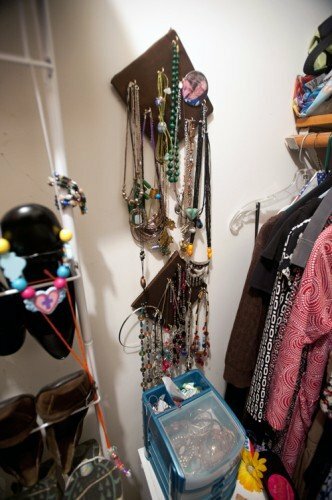 I have jewelry stored in three different places. 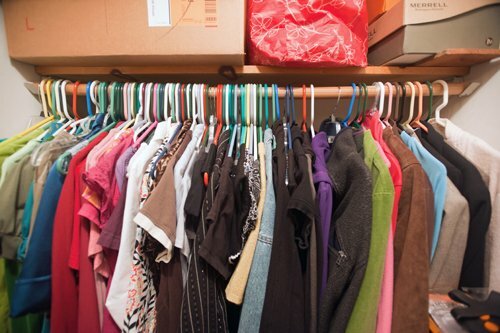 Two clothing racks are jam-packed and one isn’t even half utilized. Items to donate are overflowing their basket. The shelves are overloaded and not efficient. See? It’s just sort of one big botchy mess! Look how the main clothes rack is so darn overloaded that it bows in the middle. Notice how my collection of necklaces has completely outgrown the necklace hangers I have. 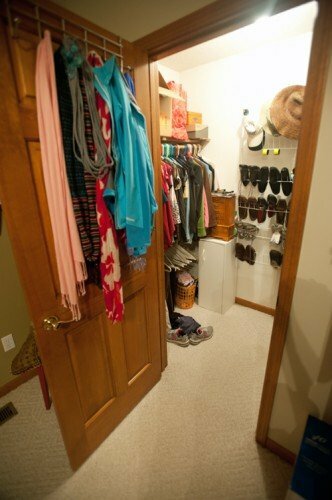 I mentioned earlier this week that I could not wait for the Organize Your Closet workshop to begin. And by that, I meant that I really cannot wait! So I’ve already downloaded my materials and have begun taking my first steps towards organized closet bliss! The workshop doesn’t actually open until March 13, 2012, but hey, there are perks to working here. I can pick Aby’s brain as I go (just like the workshop participants will be able to do), but the one major downside to starting now is that I don’t have all the other participants in the workshop forum for added support and inspiration. That is a bummer, so my work-around is that I’m going to share my progress on the blog over the next couple weeks. I will be looking to all of you to help keep my accountable and to give me a push if I get stuck on something. I hope you won’t mind. After all, you are my lifetime BFFs now, remember? LOL Pinky! Thanks for cheering me on. I guess I’m pretty committed now, aren’t I? Hi Jennifer, Good luck with your closet. One thing my hubby did is added an extra shelve above the one that I already had and made it go completely around the top of the closet including over the door for plenty of storage. It was just wasted space and now we store out of season clothes on the part of the shelve above the door and I was surprised it didn’t make the closet darker. I love your rack on the door but we store our ironing board behind the door so that leaves that great idea out for me. Can’t wait to see the finished product. Good Luck! Dottie, love the idea of an extra shelf like that, and you are so right about that above the door space. I actually am thinking that might be the perfect spot for my hats! Thanks so much for stopping by to comment!